Billy Bragg and Joe Henry's excellent Shine a Light was one of my favourite folk albums of 2016. It saw the intercontinental songwriting duo recording great American train songs on board a train going from Chicago to Los Angeles, as well as at train stations, on platforms and in hotel rooms. But it was not, Henry told Hillside's main stage crowd Sunday night by way of an introduction, a project done out of nostalgia: "Bill and I wanted to reclaim some of our folk traditions the way theatre companies still do King Lear," he explained. The project was guided in part by their "patron saint" Lead Belly (they kicked their set off with his "In the Pines"), but their approach was more Louvin Brothers: Close vocal harmonies and both men often singing together. Live, the old songs felt both contemporary and familiar, with Bragg and especially Henry's banter providing poetic context. They acknowledged all the immigrants — and recently freed slaves — who were involved in building the railroads, as well as the passage by El Paso, Texas, with Mexico on the other side, lending new meaning to the Carter Family song, "Railroading on the Great Divide." Heartbreakingly, you can't take a passenger train to Nashville anymore; the train station is now a hotel that the duo stayed in. And where passenger trains run, they are often meant for tourists, running once every day or two. They sang "The L&N Don't Stop Here Anymore," with Henry's hummed harmonies and guitar intricacies making it sound quietly haunted. In addition to the songs off of Shine a Light, Bragg and Henry played a few that occurred to them as being train songs after they'd completed their voyage: Bob Dylan's "Tonight I'll Be Staying Here With You," in which they traded off lines on the bridge, and Woody Guthrie's "Ramblin' Round" (which sounds like "Goodnight, Irene," another Lead Belly tune). Some of the inclusions were obvious: call-and-response "Rock Island Line," led by Henry, and "The Midnight Special," from which Shine a Light draws its title (prisoners at the Sugarland prison farm believed if the train's lights shined on you, you would be next to get parole) but some of the songs weren't as immediately obvious in their connection. They sang Gordon Lightfoot's "Early Morning Rain" — about the disconnect between the plane and train age — and (my favourite) the fluid "Gentle on My Mind," by John Hartford. "We both loved it our whole lives," Henry said, "And we realized after playing it together in a sleeper car that the character speaking was doing so from a hobo jungle remembering the spectre of love." It's written from the perspective of a transient in a train yard. The thing that ties these songs to the modern day isn't so much trains, as technology keeps changing, but that they are stories about struggle and freedom and economic migration. 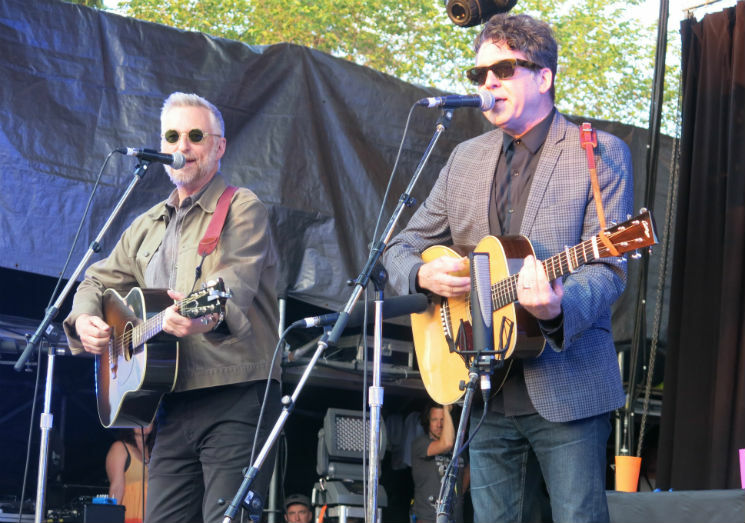 As Bragg mentioned in a brief two-song solo set (both singers sang a couple of tunes alone before coming back together), folk music is about empathy, and empathy mixed with activism equals solidarity. As we walked away that night, Bragg's "There Is Power in a Union" — which the crowd had eagerly sung along to — lingered in the air.